I think I’ve mentioned before my fascination with the Tudors, so when I saw this audiobook at my local library I couldn’t resist. Plus it was Alison Weir, whose books I like in general, regardless of their subject. Of all Henry’s wives, Anne is probably the most interesting and the one who most influenced English history as it was Henry’s desire to marry her – after eight long years of trying to get a divorce – that led, in part, to his break with Rome and the forming of the Church of England. She is also probably the most disliked of all his wives – reviled, even, at the time for having stolen Henry’s heart from the beloved Katherine of Aragon, and the subject of much gossip and misunderstanding, both before and after her death. This isn’t the first book on Anne I’ve read and it’s not the first time she has been written about by Weir but I haven’t got bored yet and, here, I found more to peak my interest and help fill in the gaps (possibly) of what I know. I say possibly because little is actually known about Anne, not even what she looked like – there is only one known confirmed likeness of her because they were all destroyed after she was executed. Much of what was written at the time was by people who disliked her and were biased against presenting a likeable or sympathetic person for the most part. Weir manages to do that, though, allowing a picture of Anne to develop that is not quite the evil home wrecker she is often made out to be. There is no doubt she schemed and played politics but so, it seems, did most people back then. It was the way the world of the royal court worked and it was an accepted part of life. Perhaps that Anne tried to play the game as a woman was part of the problem, as was the fact that she threatened the established power of many of England’s richest families. It will always be impossible to know exactly who she was and whether she was guilty of the crimes she died for but that is part of the fascination. 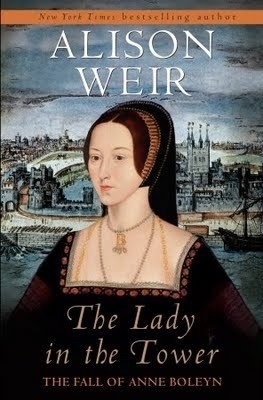 Weir presents the facts, few as they are, and the conjecture, giving her opinion on what might or might not be true, coming to the conclusion she probably was innocent. I tend to agree. For those who want to know more about Anne, this is a great book. She really is the focus, not Henry – though there is plenty of him and Cromwell for those interested in them too. It is full of little details, like her having a double fingernail, which make her come alive and feel less like a character, more like a person. As an audiobook, it was easy to listen too, with good narration and pace. There was plenty to keep me listening, including a great chapter at the end that talked about ghost stories and legends relating to Anne. I have a huge desire now to go start spending nights in Norfolk (her birthplace) looking for a lady in white. I’ll let you know if I find her! P.s. If you couldn’t guess, I really liked this book – a recommended read. I have several of Weir’s books but haven’t any of them yet. I’ve always been interested in Anne Boleyn and all of Henry’s wives actually. This sounds like an interesting book and I like that it was readable. So often history can feel like reading a textbook. The readability is one of the reasons I like Alison Weir. I love history but still can’t read anything too dry – it reminds me of school. Sounds interesting. I love the Tudors and this period of history in general. I haven’t tried listening to a historical book on audiobooks, this might be one to start with. I love that it made Anne come alive, sounds like it was very entertaining. I find that non-fiction are the only ones I can listen to. Definitely worth giving a go. This really sounds like something I NEED to read. Fantastic review, you have totally convinced me to get it! Thank you. It really is a good book!